I think that many cultures have a tradition of meat pies, or pastries filled with meat, but my new found favourite is this savory and sweet chicken phyllo pie from Morocco. 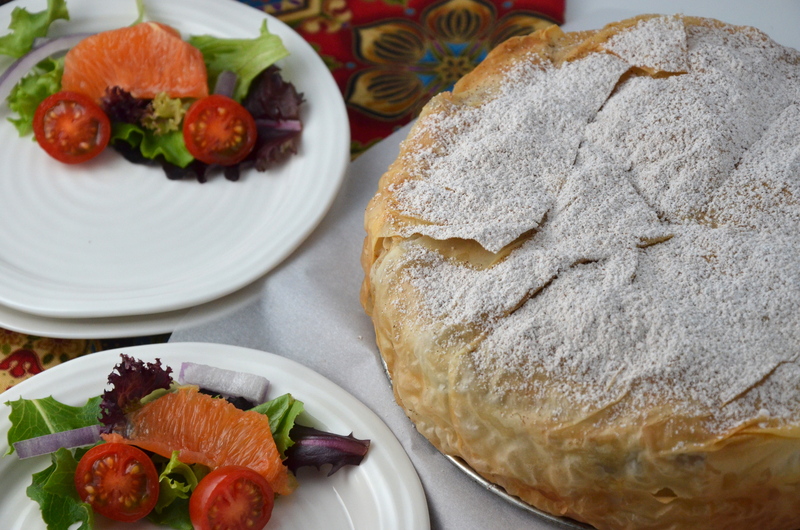 I love the buttery crunch of the phyllo pastry and the way that Moroccans add sweetness to this dish by combining the meat with dried fruit such as apricots or raisins, and then dusting the top of the pie with icing sugar and cinnamon. The result is a rich, exotic dish with a surprising burst of sweetness when our taste buds meet the dried apricots and the dusting of sugar that tops the pie. I recently took a couple of Moroccan cooking classes with Chef Glenys Morgan at my favourite kitchen store, Posh Pantry. I was so excited to finally learn how to make this pie and couldn’t wait to come home and recreate it in my kitchen. This recipe is deceptively simple to make and it becomes the showpiece of your dinner table. The night before, I made the chicken mixture, to just before the eggs and the herbs are added. When I came home from work the next day, I finished off the recipe and served it warm from the oven with a fresh, colourful salad. I made the pie in an 8 inch springform pan, but traditionally it is made free form. The cook just makes a pinwheel shape with the pastry and piles the chicken mixture in the middle and then folds the pastry around the meat to create a round pie. If you want to, you can also make individual pies as you would in Spanakopita. Wouldn’t that be a wonderful treat to find in your lunch or to take to a picnic? This is Chef Glenys Morgan’s recipe. Thanks Glenys! I am really excited to be bringing this pie over to Angie’s Fiesta Friday! I know they are going to enjoy it and I can’t wait to show off what I learned in class! Honestly there is nothing like taking a cooking class to get the creative juices flowing and to get you excited about cooking something new for your family, friends and blogging buddies at a wacky Friday night blog party! Bon appétit everyone! Heat the oil in a large skillet and add the chicken, onion and spices. Stir to brown lightly. Add the chicken stock and cover, simmering until tender. Remove the chicken and reduce any excess liquid. Remove the chicken from the bone and shred it. Whisk the egg into the onion mixture and stir to cook slightly. Remove from heat and add the shredded chicken, cilantro and parsley. Mince the apricots and add to the mixture. Sprinkle ½ the almonds on the bottom of the pinwheel. Mound the chicken mixture in the centre and dust with the remaining almonds. Begin to fold the phyllo sheets over the chicken mixture. Butter the layers and tuck in the phyllo sheets. Brush again. Bake at 350° until golden brown. (about 35 minutes) If excess butter is draining onto the pan, blot with paper towels to prevent burning. Cool 15 minutes. Place icing sugar and cinnamon in a mesh strainer and dust the top of the pie generously. Can´t stop imagining that 1001 nights´smell evaporating when you cut the pie! Love the flavors…. wonderful! Thanks Serena! You have a wonderful Easter too! Sounds amazing-ooh, can’t wait to try!! Hey Chica, Como estas? Glad you like the look of it! I mean Julianna :D. Please can you edit the post, I need a strong coffee! Good timing. i was just thinking of making a chicken pie, but seeing your recipe makes what I had in mind seem pretty blah. Thanks for sharing it. You’re welcome, Hilda! Let me know how your chicken pie turns out! Wow, Julianna! You are right, this dish would definitely be the showpiece of any table. I can almost smell all those delicious aromas of spices and chicken and baking phyllo! I am interested in taking cooking classes, too, as everyone I know who has taken them recommend them highly. I can’t wait to see your other creations you’ve learned from the Moroccan cooking class. Have a wonderful weekend! Hey Ngan, you are a very kind hostess! Well, I have taken some awesome cooking classes this winter and will surely bring some of the things that I have learned, to future Fiesta Fridays. You have a wonderful weekend too and it’s nice to have you and Nancy as co-hosts! Yum, Chef!! Please pass me the plate with that wedge of pie on it! Wow! Thanks so much Nancy! And it is nice to have you and Ngan as co-hosts this week! You two make a wonderful team! Well, I love Spanikopita too, but this would be a nice change. I hope you like it! Thanks Julianna…you and Hilda raised the bar high, I hope we can reach it! Looking at the ingredients, I don’t know how I couldn’t like this. You’ve left me thinking about it all morning! Oh, I do that too! Wander around dreaming about certain recipes all day…crazy food bloggers, huh? This sounds realllly delicious! 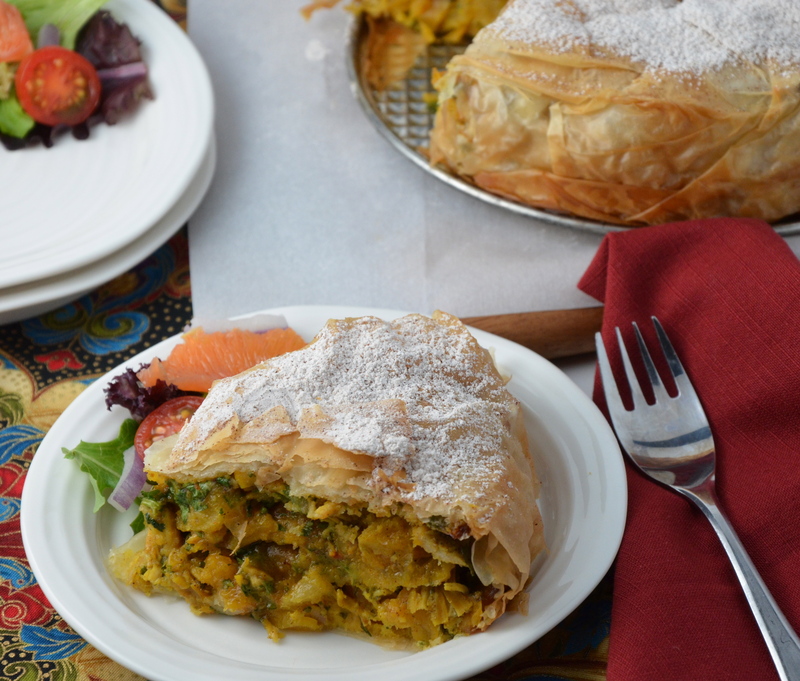 The phyllo and apricots and almonds and chicken – so much good stuff! Wow! So full of taste! I’m loving this chicken pie, and the idea! I’ve certainly never made a chicken pie like this, but I love the concept! After the amazing meatballs that I did with your recipe I trust you, word after word. I’ve never made a meat cake your recipe and your photos make me feel to try. I’ve checked all the spices you’ve used, I’m sure that the small around the kitchen had to be unbelievably good! Hi Patty! I’m glad you like the look of the pie! This looks so good, Julianna. Love the ingredients- can imagine how flavorful it would have been. Beautiful pie chef! The salad on the side is the show stealer for me ;). Mmmm, yes I’m rather fond of the salad on the side too! Oh no, nothing plain and boring about this pie at all!! LOL! It’s not so waist-expanding! Just had one piece instead 😀 Enjoy! I was so excited when I saw this post title, and I was not disappointed, this is a beautiful and beautifully made pie! Bastilla has been one of those dishes I want to learn to make, properly. Yours turned out so will, what a lovely recipe! This is a great dish, have had it several times but have never tried to make it myself, you make it sound so easy I may just give it a try. Oh, it is really easy! You will be delighted with the results! This looks so good! Feel like digging right into it! What a perfect combination of textures – the flaky crust and the soft chicken inside. Yum! I love Moroccan dishes and this is a “must try” recipe. Thanks for bringing it to the party. 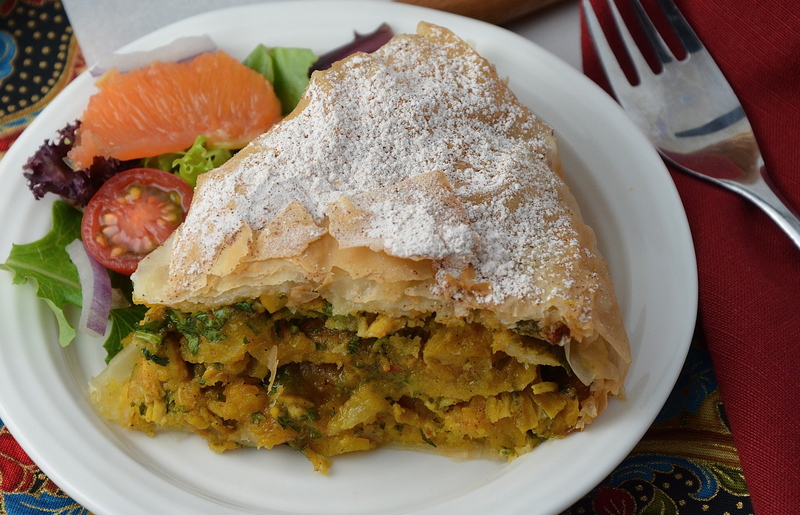 So glad to see this recipe of Pastilla, I’am a huge fan of Morocco and Morrcan food. I first discover Morocco in 2002, and since that I consider to have a love affair with this country and it culture ! My next post will be for it. Thank you so much for sharing this nice recipe with us. Hey Chantal, I just wanted to let you know that I can’t connect to your “.com” How should I go about following you? This looks divine! I make something similar with the same spices, shredded chicken, dates, and raisins. Looking forward to trying your recipe. Actually, I haven’t posted it yet, but you’re reminding me that I should! And happy to comment 🙂 very cool that you took Moroccan cooking class(es)! Well, I hope you do post it, Laura! And yes, I love taking cooking classes – I took a number of them this winter just for the fun of it! Love this! Just got a Moroccan cook book and this will be added. Thanks! You are so welcome! This on is a keeper!